Over the summer, I spent some time at my parents house in Upstate New York because my Princess attended a nearby camp. At the farmer’s market, I picked up some portobello, king oyster, and fresh hen of the woods mushrooms. I love mushrooms so I decided to make a mushroom dumpling. Ina Garten, the Barefoot Contessa, is one of my favorite TV chefs, and I think her sauteed wild mushrooms recipe is delicious so I decided to use this recipe as a starting point for my mushroom dumpling. First, brush the caps clean and remove the stems. Chop all the mushrooms to a similar size. Heat up some olive oil in a large pan or pot on low heat. Add the shallots and cook until translucent. Add the mushrooms, butter, salt, and pepper and cook on medium heat until the mushrooms start to release their juices. Stir the mushrooms while they cook. Put the mushrooms into a bowl and stir in the garlic, parsley, and salt. Using either store bought skins or homemade skin, scoop a heaping teaspoon into the center of the skin. Leave a half inch between the filling and the edge of the skin. Coat the bottom of a non-stick pan with oil. Fill the bottom of the pan with dumplings. Line them up snug. Coat the bottom of the pan with a thin layer of water, put a cover on the pan, and cook on medium heat. After fifteen minutes check the dumplings to make sure most of the water has disappeared. Wait another five to ten minutes. When all of the water is evaporated and the bottoms are brown and crispy, the dumplings are ready to eat! These mushroom dumplings are amazing. After you bite into the crispy skin, you then savor the buttery mushroom filling…heavenly. This is the dumpling for any mushroom lover. Brush the mushroom caps with a clean sponge. Remove and discard the stem. Dice all the to a similar size. Heat the olive oil in a large (11 - inch) Dutch oven or saucepan. Add the shallots and cook over low heat for 5 minutes, or until the shallots are translucent. Add the butter, mushrooms, salt, and pepper and cook over medium heat for 8 minutes, until they are tender and begin to release their juices, stirring often. Stir in the garlic, parsley, and sprinkle with salt. Prepare to wrap dumplings by filling a small bowl half way with water or a beaten egg. Grab a tray to put your wrapped dumplings. If you plan to freeze all or some of the dumplings, line the tray with plastic wrap or parchment paper. Make sure the dumplings do not touch and are all “sitting” by themselves. Freeze the dumplings for 1 hour and then place in a freezer bag for up to 3 months. Label the bag with today’s date. To wrap dumplings, scoop a heaping teaspoon of filling into the center of the dumpling skin, use your fingers to brush the water or egg wash around the edge of the skin, fold the skin in half, and close with three pleats at the top. Pinch the edge tightly to make sure it is completely closed. Place firmly on hard surface to make sure dumpling “sits” on its own. Continue these steps until there is no more filling. Will make 20-25 dumplings depending on the amount of filling used in each dumpling. To cook the dumplings, coat the bottom of a non-stick pan with canola oil, then fill the bottom of the pan with dumplings. The dumplings should be lined up snug. In a 10″ pan, use 1 tablespoon of oil and fill with at least 11 dumplings. Pour water into the pan until it completely coats the bottom of the pan. Put cover on pan and cook on medium heat. After 10 minutes open the cover and make sure most of the water has disappeared. Wait 5-10 more minutes and the dumplings should be done. Make sure the bottoms are crispy and brown. Keep cooking until you get this. To get the dumplings out of the pan, you can (1) take them out one-by-one with a chopstick or tong. (2) Loosen the dumplings on the edge from the bottom of the pan with chopsticks or a wooden spatula. Grab a large dinner plate (10″) and cover the dumplings in the pan. Flip the pan over so all the dumplings come out of the pan at once. This makes a beautiful flower presentation of the dumplings. Trader Joe’s is my favorite grocery store. Great price for organic food and great service. I picked up a bag of their pork gyoza, the japanese word for dumpling. Here is my criteria for delicious dumplings. Filling: great flavor, nice texture, healthy balance of meat and lots of vegetables. I am allergic to shrimp and do not eat red meat so you won’t see reviews (or recipes) on dumplings with these ingredients. The dumplings have a textured bottom. Their closures are messy but after they’re cooked you can’t tell. The list of ingredients included things I knew and things I had not heard of. I always get nervous about the things I’ve never heard of. I followed the cooking instructions for stovetop cooking. I filled a 12″ pan with the whole bag. The Filling: Pork, cabbage, onion, green onion. It’s a little too oniony and peppery for my taste. The Trader Joe’s vegetable gyoza had the same strong onion taste. The Skin: thin, just the way I like it. Summary: The filling’s strong onion and pepper taste was strong. The girls didn’t like it. If it was just me, I could keep a bag in the freezer for emergency purposes but since the girls won’t eat them, it defeats the purpose of having an emergency stash. Star rating: 2.5 out of 5. I’ve been working on a vegetable dumpling recipe for some time now and I finally created one I like. With the farmer’s markets starting to open, I will have more fresh vegetables to play with so stay tuned for more recipes to come. These dumplings are so much lighter without meat and just as tasty. Start by chopping up the fresh shiitake mushroom caps. A cup of mushrooms is about 6 to 8 caps. Chop up a cup of scallions both white and green parts. Chop up two cups of napa cabbage. This is about four leaves depending on the size of your cabbage. Shred a cup of carrots. I like to use organic carrots. Soak the glass noodles in water for at least 15 minutes and then chop into small pieces. The softer the noodles, the easier they are to chop. Chop the Chinese chives or spinach. Put the mushrooms, chives, napa cabbage, carrots, noodles, salt, corn starch, and sesame oil in a large bowl. And mix together. Use your hands, they are the best mixers. (1) Place the filling in the middle of the dumpling skin, dab your fingers in the egg wash and coat the edge of the skin, then fold in half but do not press shut (2) You will make three pleats at the edge of the side closest to you. To make a pleat, pinch the skin in between your thumbs and then press firmly to stick to the back side of the skin. (3) Repeat two more times (4) Evenly space the pleats and place firmly on a flat surface to make sure the dumpling “sits” on its own. Pinch the edge firmly to make sure the dumpling is completely sealed. Wrapping homemade skins is a little bit different and you can learn more here. Coat the bottom of a non-stick pan with oil. Fill the bottom of the pan with dumplings. Line them up snug. Cover the dumplings half way with water, put a cover on the pan, and cook on medium heat. After fifteen minutes check the dumplings to make sure most of the water has disappeared. Wait another five to ten minutes. When all of the water is evaporated and the bottoms are brown and crispy, the dumplings are ready to eat! I took it easy and slow to get these dumplings out this time. These veggie dumplings are light and delicious. My little girls love the noodles inside! To make the filling, combine the shiitake mushrooms, scallions, napa cabbage, carrots, Chinese chives or baby spinach, rice noodle, salt, corn starch, and sesame oil in a large mixing bowl. Thoroughly mix. To wrap dumplings, scoop a heaping teaspoon of filling into the center of the dumpling skin, use your fingers to brush the water or egg wash around the edge of the skin, fold the skin in half, and close with three pleats at the top. Pinch the edge tightly to make sure it is completely closed. Place firmly on hard surface to make sure dumpling “sits” on its own. Continue these steps until there is no more filling. 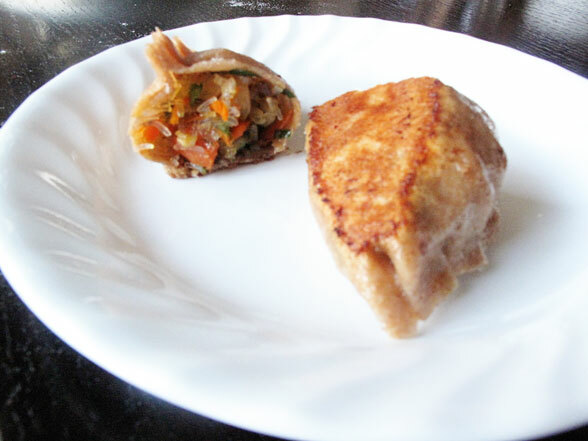 Will make 40 – 50 dumplings depending on the amount of filling used in each dumpling. To cook the dumplings, coat the bottom of a non-stick pan with canola oil, then fill the bottom of the pan with dumplings. The dumplings should be lined up snug. In a 10″ pan, use 1 tablespoon of oil and fill with at least 11 dumplings. Cover the dumplings half way with water. Put cover on pan and cook on medium heat. After fifteen minutes open the cover and make sure most of the water has disappeared. Wait 5-10 more minutes and the dumplings should be done. Make sure the bottoms are crispy and brown. Keep cooking until you get this. I’ve been buying store-bought dumpling skins for all my life and the other day I decided to look at the ingredients. Nothing too too bad, but a couple ingredients are preservatives and aren’t your normal-in-the-kitchen-items, so I decided to make my own skins. As a mom, I carried both my girls for nine months, breast fed them, hold them in my arms all night when they have been sick. I consider these all a labor of love and now I’m adding making homemade dumpling skins to that list. Maybe it’s because after chopping all the ingredients in my filling, I just want to wrap, but instead have to hand roll each skin. Maybe it’s because I’m just learning and with more practice the rolling will be much faster. Whatever it is makes me savor each dumpling so much more and I wish my girls would eat them a little bit slower just so they can appreciate all my hard work. After trying a few recipes I found online, I used Andrea Nguyen from Asian Dumpling Tips‘ recipe on CHOW and Annie and Nate from House of Annie as resources to come up with the best recipe to my taste and instruction. Start by mixing the flour and salt in a large bowl and then carve out a well in the middle. In three phases pour the just boiled water in a steady stream over the flour making sure to moisten the flour evenly. Use a wooden spoon to mix the water and flour mixture. The flour will turn into lumpy bits. Roll each section into a 1-inch log, then cut into 8 equal pieces. Shape each piece into a disc and then press each disc in a tortilla press or between small plates covered with plastic wrap or zip-top bags. The tortilla press would probably make the disc flatter which would make the rolling process easier, but the plates are a good alternative (thank you Annie and Nate!). Use a floured rolling pin to roll out the discs even more. I like my skins thin so I roll mine out so they have just enough width to hold the filling. Holding the floured disc gently in the center, use the floured rolling pin to roll back and forth pressing out the edges. Please excuse my dry dumpling mama hands, flour brings out the worst in them. Rotate the disc until all edges are to your desired thickness. The skin should be between 3 – 4 inches long. Now just a few notes about wrapping and cooking the homemade skin. The skin is more elastic then store-bought skin so you can put a little extra filling in your dumpling. Since my fillings have a lot of vegetables in them, I like to stuff my dumplings. Leave a half inch between the filling and the edge of the skin. I line each dumpling up on a sheet pan lined with plastic wrap after I wrap them. I cook the number of dumplings I want to eat and then place the rest in the freezer to be eaten later. To make sure the dumplings do not stick to each other while frozen, freeze the dumplings for at least thirty minutes before placing them in a zip top bag. The process of cooking dumplings with homemade skin is the same as store-bought skin. Coat the bottom of a non-stick pan with oil. Fill the bottom of the pan with dumplings. Line them up snug. Cover the dumplings half way with water, put a cover on the pan, and cook on medium heat. After fifteen minutes check the dumplings to make sure most of the water has disappeared. Wait another five to ten minutes. When all of the water is evaporated and the bottoms are brown and crispy, the dumplings are ready to eat! The homemade fresh skin is very tasty. There is a little sponginess because they are fresh which is more noticeable when you boil the dumplings. My Grouchy Husband really likes how much crispier the bottoms of the pan fried dumplings are. I will still continue to use store-bought dumpling skins because they are a time-saver, but every chance I can, I will definitely be making my own skins because I love the idea of making a dumpling that is 100% from scratch. Use a floured rolling pin to roll out the disc even more. Holding the flattened disc gently, use a floured rolling pin to press out the outer edges of the disc. Roll back and fourth, continuing to rotate the disc until all edges have been pressed out to your desired thickness. The dumpling skin cannot be too thin because it has to hold the filling without it breaking the skin. Add flour if necessary to keep the dough from sticking and tearing. The final skin should be between 3 and 4 inches long. When I was in Hmart, the largest Asian grocery store in town, yesterday to eat lunch with my mom, sister, and my girls, I noticed the Chinese food menu had homemade dumplings. These were new to the menu so I had to give them a try and share my opinion. I ordered the fried dumplings. For some reason I expected pan-fried dumplings even though the sign said fried dumpling. Here is my criteria for delicious dumplings. The dumplings came out hot. They were greasy but that is expected because they were deep fried. It was a nice treat to eat the crispy skin. The dumplings came with Ja Jang Sauce, a black bean sauce you can also buy here. It has some chopped green onions in it. This is the first time I’ve tasted Ja Jang sauce. The Filling: Filling is pork, cabbage, onion, and chives. Distinct chives taste. A little too peppery for my taste. The Skin: Not as thin as I like, but very crispy. Summary: The filling is too peppery for me and I don’t usually like to eat fried dumplings because they are greasy. The Ja Jang Sauce was plain but complimented the dumpling flavor nicely. I won’t be ordering these dumplings again. Star rating: 1 out of 5.